The purpose of the hearing was to highlight the potentially ominous long-term implications of simply maintaining America’s existing nuclear forces while China and Russia continue to modernize. With the government slated to cut defense spending by more than $450 billion dollars over the next decade, proposed reductions for funding nuclear modernization have gained traction in Congress. Increasingly, however, policy makers who oppose budget cuts for America’s nuclear weapons program point to the opacity of China’s nuclear weapons program and the rising threat it could represent to make their case. Mark Schneider, senior analyst for the National Institute for Public Policy, shared Turner’s misgivings. “The Russians and the Chinese are modernizing every element of their strategic triad,” he told the subcommittee, referring to the three methods for delivering nuclear warheads: ballistic missile submarines, intercontinental ballistic missiles, and bombers. However, Jeffrey Lewis, Director of the James Martin Center for Nonproliferation Studies’ East Asia Nonproliferation Program, reminded the subcommittee that every nuclear weapons state, including the United States, continues to upgrade its nuclear warhead delivery platforms. Lewis also told the committee that both China and Russia have focused on modernizing their means of delivering nuclear weapons, but neither country has attempted to create new nuclear devices. Moreover, Chinese and Russian modernization efforts haven’t altered the deterrent effect of the U.S. nuclear arsenal, Lewis told subcommittee members. “There are no foreseeable scenarios under which either country could initiate the use of nuclear weapons against the United States, our force abroad or our allies without suffering an overwhelming destruction that would outweigh any possible gains,” he said. The alarm with which Americans like Rep. Turner and his supporters view the modernization of China’s strategic triad is misplaced. According to the Pentagon’s latest annual report on China’s military capabilities, the People’s Liberation Army Navy (PLAN) has a maximum of three operational ballistic missile nuclear submarines in its fleet, and possesses no operational SLBM missiles. In short, China does not currently possess a credible sea-based deterrent, and Beijing’s attempts to rectify this are not particularly threatening. Moreover, China’s ballistic-missile submarines are not believed to be very stealthy, giving U.S. attack subs and other anti-submarine warfare capabilities a distinct advantage. In fact, of the five nuclear states recognized under the nuclear Non-Proliferation Treaty, China is the only one without a credible sea-based deterrent. Unfortunately China’s assurances have done little to convince cynics on the Hill. Concerned rumblings from Washington over Beijing’s opaque nuclear weapons program have grown louder since the New START treaty entered into force earlier this year. Under the arrangement, both the United States and Russia have agreed to limit their nuclear arsenals to 1,550 operationally deployed strategic warheads by 2018. However lawmakers like Rep. Turner remain deeply skeptical of China’s minimal deterrence policy and suspect that Beijing is actually concealing the size of its nuclear stockpile in an attempt to reach nuclear parity with the U.S. and Russia as the former Cold War rivals whittle away at the massive stockpiles they accumulated over the past half century. China’s 5,000 kilometer-long network of tunnels has only served to inflame these suspicions. 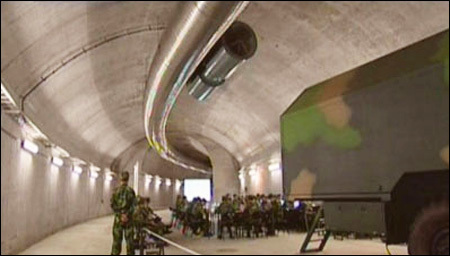 The underground system was another red flag for Rep. Turner, who expressed concerns that Beijing could use this vast tunnel system to conceal the buildup of its nuclear arsenal and transport such devices undetected. He’s not alone. A recent Op-ed in The Wall Street Journal speculates that China may have squirreled away between 1,000 to 3,500 nuclear devices inside the vast underground facility. This, however, is purely speculation and runs counter to known aspects of Chinese force posture, including its disinterest in pacing multiple independently targetable re-entry vehicles (MIRVs) on its ICBMs or developing a robust strategic early warning system. Beijing has made its nuclear security strategy very clear: China wants enough nuclear weapons to establish a credible nuclear deterrent, but not enough to acquire counter-force capabilities. Nevertheless, there is a deep-seated distrust of Chinese intentions among many Americans. “Now is not the time to be reducing American nuclear and conventional deterrent capabilities, especially in Asia,” Richard Fisher, a senior fellow at the International Assessment and Strategy Center told the subcommittee. Citing China’s policy during the Vietnam and Korean wars, Fisher concluded that any “perceived weakness in the United States “ will “embolden[China] to take risks.” His assessment, however, rests on the questionable assumption that changes in China’s leadership, economy, and geopolitical standing have had no effect on Beijing’s behavior in the last thirty years. Ultimately, though, worst-case scenario assessments like Mr. Fisher’s and Mr. Schneider’s are fueled in part by Beijing’s lack of transparency regarding its nuclear forces. Speculation about Beijing’s strategic aims and capabilities will continue until China reveals more information about its strategic force posture. Increasing openness on the part of Beijing can help prevent strategic missteps on the basis of such worst-case assessments, and the current dialogue among the NPT nuclear weapons states on transparency offers just such an opportunity. This entry was posted in Asia, China, Nuclear Weapons, Uncategorized and tagged China, East Asia, nuclear modernization, Nuclear Weapons, Sen. Michael Turner, Underground Great Wall. Bookmark the permalink. The China scare is really an attempt to grasp for straws to justify high levels of expenditures for nuclear weapons modernization and weapons systems that serve no strategic value. An excellent point. Can you say: “military-industrial-Congressional-complex”? Indeed Daryl – I wish we were doing a better job educating Americans about the incestuous relationships between the military, weapons industry ,Congress and the White House . The press is largely asleep. One well-kept secret relating to nuclear weapons involves repeated incursions by unknown aerial objects at both American and Soviet weapons sites during the Cold War era and beyond. Declassified documents from both countries confirm this strange development beyond a reasonable doubt. Sometimes life is indeed stranger than fiction. The US will soon go bankrupt and become a banana republic thanks to its enormous ependiture on the Pentagon,which has become a monster sucking massive and insatiable amounts of dollars.Since China and Russia will be reduced to ashes if they were to launch a n strike why the need for a missile shield and more nm?It is to perpetuate US military supremacy and make the two countries subservient to US interests.Now what if the tables were turned?The US would be doing exactly what the two countries are doing. It is aimed at minimising damage to the US if the US launches a n strike first. So you can’t blame the Russians and Chinese for expanding their nw. This is to ensure the US won’t escape painfree.That is the problem .The PLA aint aiming for parity with US power. The ability to retaliate and inflict unacceptable damage to the US is what is causing the Pentago n to get nervous. As time goes on,bot the Russians and Chinese will be able to increase the damage and carnage to US interests will grow even if the US were to install lmissile shields in every country on earth.